Alec Lachman and Jennifer Vosters from Voices Found Repertory speaking with Lake Effect's Bonnie North. 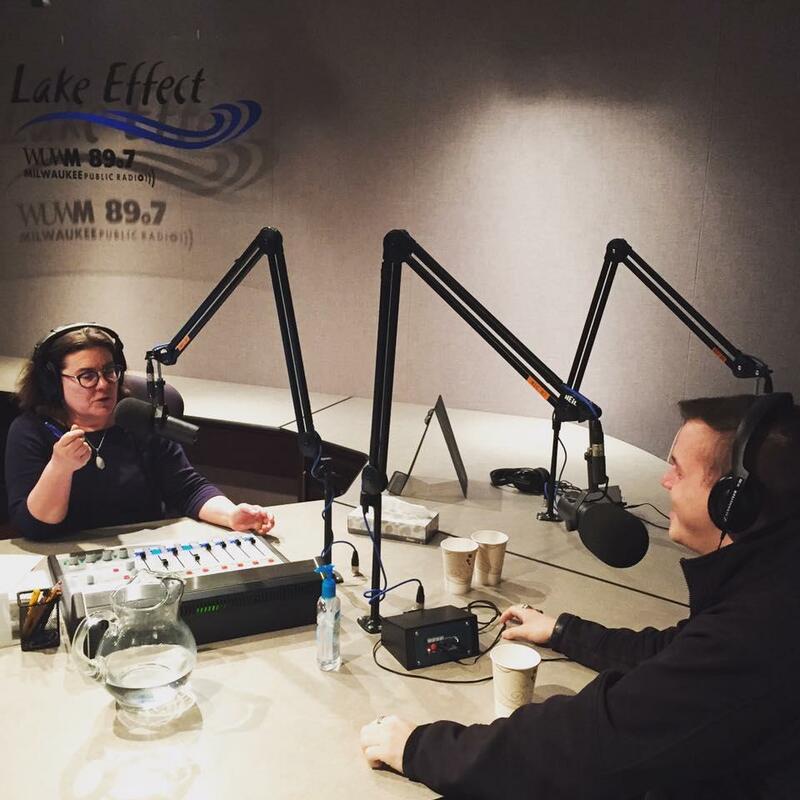 Alec Lachman speaking with Lake Effect's Bonnie North. In Milwaukee's well-established theater scene, Voices Found Repertory is one of the new kids on the block. The material they generally present, however, dates back nearly five centuries. The group specializes in Shakespeare, but also presents some new works as well as some commissioned from playwrights. Alec Lachman, one of the founding members, says this specialization was the inspiration for creating Voices Found. "We wanted to see more Shakespeare and more new work done. You know, new playwrights, new plays, and more opportunities for young actors, for people coming out of school to play roles, to get a chance to do things that they normally wouldn't get cast as," says Lachman. The organization's most recent production, Richard III, will be a gender-blind retelling of the classic Shakespearian historical play. The group stays true to the original text, relying heavily on the First Folio, the Royal Shakespeare Company and the Arden. But they do cut their scripts for time, since many audiences have a hard time sitting through a three-hour (or five-hour) play. "It's a long process to cut scripts. We put them all up on the wall, we put the whole script up, and we start to go through and pick out which pieces are the most important or which pieces we feel are necessary to the story," says Lachman. "I think it's important, especially in classical theater and especially in Shakespeare, for actors to kind of see their role as a conduit for the text; to be, sort of the avenue through which the audience is able to receive the story," adds Jennifer Voster, a member of the company who will perform the title role in Richard III. Voices Found Repertory's production of Richard III opens February 8, and runs through February 19, at the Arcade Theatre in the Shops of Grand Avenue. Barbara Gensler, a legend in the local scholastic theater scene, has died. According to her obituary in the Milwaukee Journal Sentinel, Barbara Gensler passed away on January 30, 2017 at the age of 81. Ayad Akhtar was sitting in the Starbucks near the corner of West Blue Mound Road and Highway 100 in late 2008 when the idea came to him - a play about relationships, Muslim-American identity and the immigrant experience in the United States, and what all of it might look like 10 years after 9/11. Those early notes became the powerful play Disgraced. Since its inception, Renaissance Theaterworks has specialized in productions that pay particular attention to women writers, cast and crew. Luna Gale, their newest offering opening Friday night, is no exception. Written by Rebecca Gilman and directed by Mary McDonald-Kerr, the play explores a basic question - who decides who is best able to raise a child?